Whether you'd be caught dead wearing your own Mario flat cap in the street or not, there's something amazing about having a growing collection of Mario merchandise, especially with the release of Super Mario Odyssey. And there's plenty of it about whether you want to shout your Mario adoration from the rooftops or not. Let's dive down the green pipe, shall we? 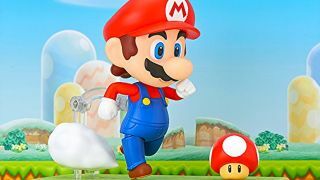 The brilliant range of Nendoroid figurines from Good Smile Company also includes a posable Mario. You get different expressions, a couple of enemies and other props with which you can create you very own scene. Also, Luigi's got his own Nendoroid too, because you need the set right? Never have Monopoly and Super Mario come together more perfectly than they do in Monopoly Gamer. It replaces money with coins, and gone are the classic iron and top hat in favour of Mario and his pals. Each of the characters, from Mario to Peach, have their own unique powers that you'll use to battle for points and defeat Bowser. You'll still have to buy property and pay rent along the way, but it's definitely a Super Mario twist on the classic Monopoly. Ever fancied designing your own Super Mario level but don't want to actually buy Super Mario Maker? This mug may be your answer. Show off your blocky creativity at work by having this pride of place on your desk holding your precious hot beverage. Or go one better and adorn your fridge with these Super Mario magnets, making teeny tiny versions of your favourite levels complete with teeny tiny little Mario and Luigi figures to leap across them. Snacking cravings be gone! You'll be too busy making Mario levels on your fridge door to even get to the goodies inside. Time to scare your pets and small children with this piranha plant hand puppet. It can receded into its little pipe and the pop out with its terrifying (floppy, fabric) teeth. Never have these Mario foes looked so cuddly or downright creepy. You might not be able to tap it on your head to unlock unlimited coins, but it does light up and make all the right noises from the Super Mario franchise, so it's close enough. Who wouldn't want their very own Mario Tanooki sitting on their shelf, or snuggled in your bed? I know I do. I want two in fact. Just look at that little racoon tail and cute ears. He's utterly adorable.